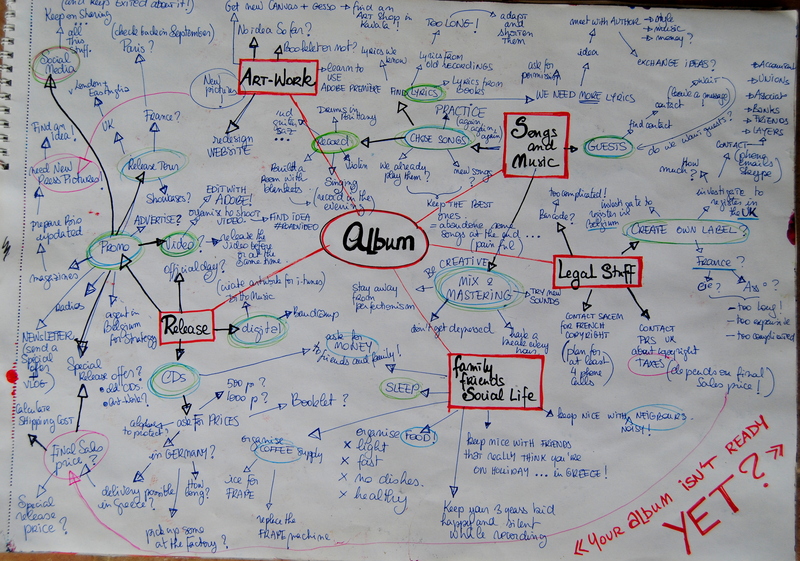 Your album isn’t ready yet + mind-mapping for self-produced album | . astrakan project . I know that people don’t have any bad intention behind the question, and we musicians love to get questions about “how things are going”. Or at least, the intellectual side of me knows it. I know sometimes people are just super exited to hear it. But how can you explain that there is no way it could be done quicker ? That going to the studio is just such a tiny wee(1) little part of all what we do? Although largely exhausted, I couldn’t sleep last night – maybe because we recorded until late one more ghosty gwerz that kept on haunting me (this one is about Yugoslavian wars, and is really painful to work on). Music and technique-wise, our level of expectations has considerably raised. Mixing and blending the sounds together is part of our music, and thus takes much more time than for an acoustic project for instance. Learning from previous launching campaigns, we want to get the best out of our release and try to plan ahead for a decent release impact – in a way, when we were younger, there were so many aspects we didn’t suspect that we were pretty relax about! Instead of manufacturing 500 of pieces each time (and then eventually re-manufacture afterwards), we decided to invest on 1000 in one go, to save money, but then, we have to plan for when and WHERE we can get it delivered… and stored! Since our activity is increasing (more touring, more sales, other projects), we have to switch to a decent legal status… and I wonder if this isn’t the most epic part of this particular release? It’s the second album with Astrakan Project. I’ll write back about it, but well. It’s kind of an extra little source of pressure. It kind of relieved me to get this end-less to-do-list organised in a visual way, kind of mind-mapping out things so that I don’t forget anything. And well, although it might look scary at first, it really helped me to see that a lot as been done, and also now, I know which part I was not paying enough attention too. The legal status part of course! Back to work – our album isn’t released yet! (1) wee=little if you haven’t spend some time in Scotland. And if you understood it, I want to play there! I want to go back to Scotland, if you have any place to suggest for next October, you’ll make my day! ← How to chose the right track order for your album?